The legacy of civil rights leader Fred Korematsu was marked on Jan. 26 in events in Pasadena and Torrance. 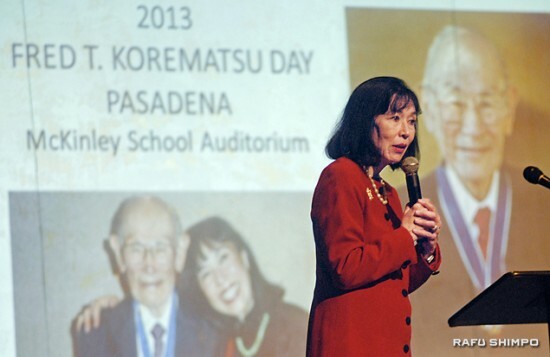 It was a busy day for Karen Korematsu, Fred’s daughter, who spoke of her father’s legacy at both presentations. The 40-year-old case was reopened by a pro bono legal team of Japanese American attorneys with Dale Minami as lead counsel. The conviction was overturned on Nov. 11, 1983, in a San Francisco federal court. Korematsu’s fight continues to resonate in current events. Last December, the families of Korematsu, Minoru Yasui, and Gordon Hirabayashi filed an amicus brief in Hedges v. Obama, a lawsuit that challenges the constitutionality of a provision of the National Defense Authorization Act For Fiscal Year 2012 (NDAA). Former Assemblymember George Nakano, speaking in Torrance, compared NDAA to Executive Order 9066, the notorious order signed by President Franklin Roosevelt authorizing the incarceration of Japanese Americans. NDAA authorizes the U.S. military to arrest and indefinitely detain anyone, including American citizens on U.S. soil, without a warrant or due process if the military simply suspects them of supporting terrorism. Karen Korematsu warned that not learning from our own history can inevitably lead to us repeating some of our worst failures. “My father and others in the Japanese American Citizens’ League were among the first to speak out after 9/11, when voices within the government were talking about rounding up Arab and Muslim Americans and again, putting them into concentration camps. We can’t let that happen,” she insisted. Several local, state and national dignitaries made appearances at the Korematsu Day events. In Pasadena, the program opened with an address from mayor Bill Bogaard. 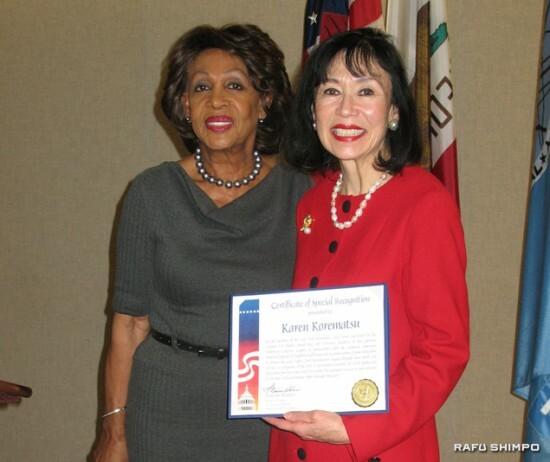 Rep. Judy Chu (D-Pasadena), chair of the Congressional Asian Pacific American Caucus, presented Karen Korematsu with a Certificate of Congressional Recognition for her efforts in continuing her father’s legacy. Chu noted that in spite of the suspicion and scapegoating endured by Japanese Americans during and after the war, not a single case of espionage against Japanese Americans was ever proven. Others attending included State Sen. Carol Liu (D-Pasadena/Glendale), and former internees Yukio Kawaratani and Phil Shigekuni, who gave a presentation on the progress being made to establish a monument and education center at the former site of the Tule Lake Segregation Center in Northern California. At the afternoon gathering in Torrance. Reps. Maxine Waters (D-South Los Angeles) and Henry Waxman (D-West Los Angeles), and Assemblymember Al Muratsuchi (D-Torrance) were in attendance. Waxman revealed that his uncle, Al Waxman, published The Eastside Journal, a newspaper that covered Boyle Heights, and wrote articles protesting the internment of Japanese Americans. “I felt pride that my uncle stood with Fred Korematsu and others to talk about this injustice,” Waxman said. Karen Korematsu lightened the mood in Pasadena with a retelling of a certain phone call her father received in In December 1997. The person on the other end informed Korematsu that he was calling from the White House, and that President Clinton wanted him to come to Washington on Jan. 15, 1998, to receive the Presidential Medal of Freedom. Korematsu ended up accepting the medal in person, and the White House ceremony — in which Clinton compared him to Rosa Parks, Oliver L. Brown and Homer Plessy — proved to be one of the proudest moments of his life. Korematsu passed away in 2005 at the age of 86. He is buried at Mountain View Cemetery in Oakland, the city of his birth, and his grave marker includes a replica of the medal.